Going To Hel . 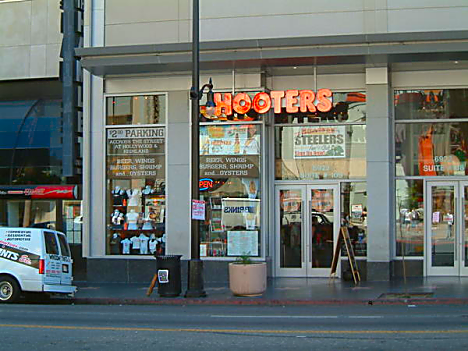 . . Hooters? 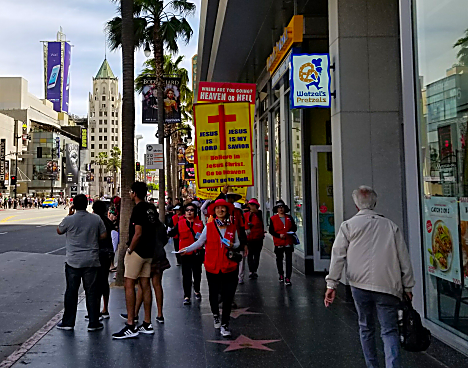 Today, our last day to journey down to LA proper, we were on the road by 9:30, heading down to the Hollywood Blvd/TCL Chinese Theater area for our 12:15 TMZ Hollywood Tour. We were going down early so we could check in for the tour early and then have lunch. I had made our reservations online a couple of days ago so all we had to do was to check in at TMZ’s booth in the Hard Rock Café, get our badges, and then head right across the street to the Hooters. 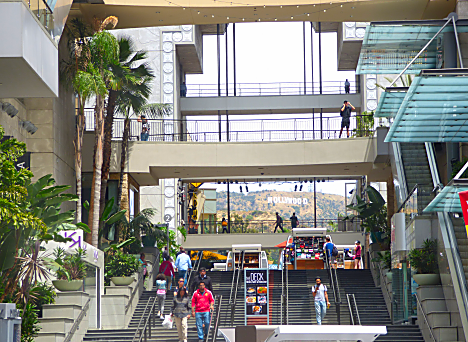 We had first eaten here in 2010 prior to our last Hollywood Tour, and hoped it was as good as before. 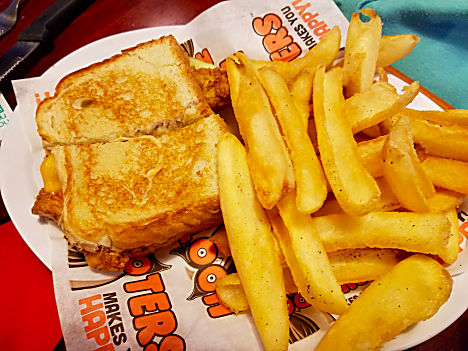 As usual we both went with our favorites, Jan getting her Original Chicken Strip Cheese Sandwich with their new Big Dipper Fries. Previously they only had Curly Fries, but the Big Dipper’s are more like Steak Fries, but shaped to hold dips/sauces. Very Good. 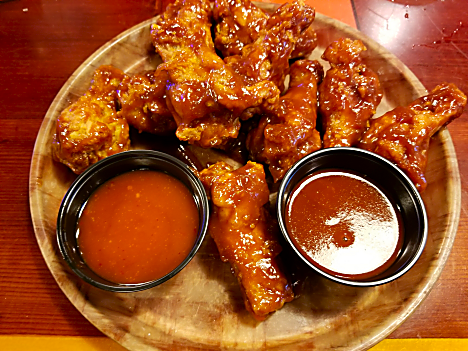 I of course went with my usual wings, all drums, coated with their Habanero BBQ sauce with side sauces of Chipotle Honey for the sweetness, and Triple Dog Dare, their hottest sauce. 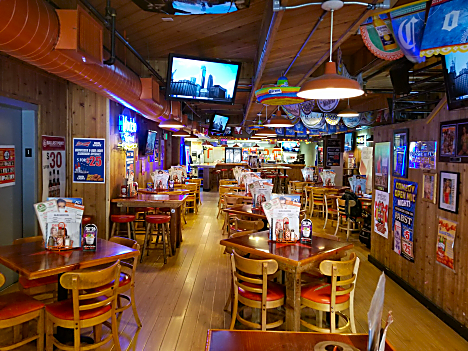 Jan and I both agreed that Hooters has really upped their game, I imagine, due to all the competition with Buffalo Wild Wings and the like. The wings are larger than they used to be, with a lighter breading that forms a slight crispy crust, almost like our absolute favorite wings, the Sweet Tangy Golden Sauce Wings, from the Beeville Diner down in, where else, Beeville, TX, where we ate several times while we were gate guarding down in south Texas. As we left Hooters we noticed a police car right in front of the door, and two police officers on the sidewalk. Turns out that apparently Jan and I are going to Hell because we ate at Hooters. At least that’s what the protesters were saying, signs, chanting, and all. 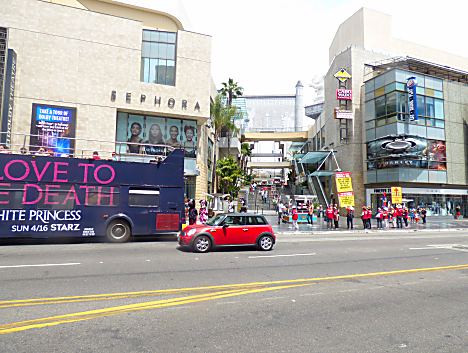 We waited about 15 minutes before our TMZ Tour Bus showed up and we were on our way. 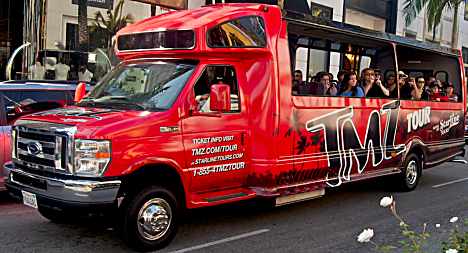 Unlike our last Starline Tour in 2010 (You can read about it here) the TMZ tour is more ‘spot the stars’ type. However the Starline tour was a ‘homes of the stars’ so if that’s your thing, take that one. Because we were star-spotting, AND didn’t see any, there weren’t really any photos to take. So nothing really from that. 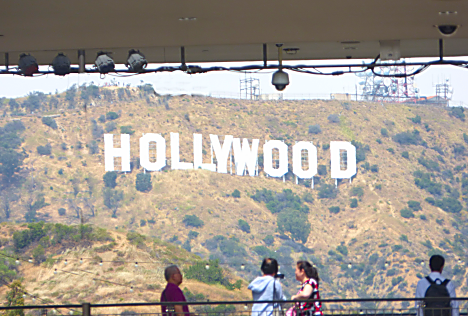 But we were shown the very best viewpoint for the Hollywood Sign, and aptly enough it’s from Hollywood Blvd. Right down the street from the Hard Rock Café there is an opening between the buildings where they’ve set up a viewing area for the tourists. We were back at the Hard Rock Café by about 2:15 and quickly got on our way home, wanting to get ahead of the going-home traffic, which we did. We did fight the winds, forecasted to be in excess of 60mph, all the way home, finally getting back about 3:30pm. Lucky for us the wind didn’t really pick up until later in the evening when is was rocking the coach back and forth. But according to the news, trees and power lines were blown down all over LA. New blog readers Rob and Dottie dropped by to say Hi. It’s always good to meet new friends. Tomorrow we’re having lunch at the Shakey’s Pizza up in Palmdale, then some shopping, and maybe a drive out to the poppy fields. 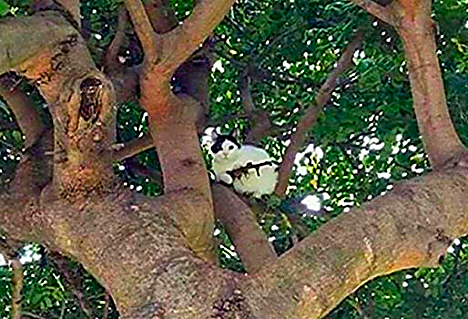 Newport Oregon Police received a 911 call that there was a cat in a tree armed with an assault rifle. True Story. Neighbor dogs were relieved to find out that it was just a suspicious-looking branch.